Google, in collaboration with Asus, has just announced the highly anticipated Nexus 7 tablet. This 7-inch tablet, housing a quad-core Tegra 3 CPU, will be sold at a price of $199 for the 8GB version and $249 for the 16GB version. Let's take a look at the current state of the tablet market and the impact this product & pricing strategy could have on market share trends. As the data clearly shows, the market penetration of the iPad is much higher among higher income groups, specifically with annual household income above $100k. In fact, NPD says that iPad owners are 50% more likely to have household incomes exceeding $100k. Considering the fact that the median household income in the US is around $50k, this is clearly very different from the expected income level profile of the potential market for tablets. This is because the minimum price points served by the iPad are still out of reach of the majority of the market. The primary reason why earlier Android tablets were unsuccessful in gaining any traction in the market was high pricing. Since the iPad was a known quantity, with superior apps & content, high prices dissuaded consumers from adopting Android as their tablet platform. Pricing was also the primary reason for the emerging segmentation trends in the tablet market and the success of the Amazon Kindle Fire. The Nexus 7's pricing strategy should address this market even more effectively, as it offers much better hardware and a larger app library at the same price. Low priced Android tablets are unlikely to attract potential iPad buyers, but they will gain market share by expanding the market, i.e. targeting consumers who would otherwise have not considered purchasing a tablet. In addition to consumers with lower incomes, the Nexus 7 could also attract high income consumers, who previously did not consider a tablet as a "necessary purchase" (this market is considerably large outside the US). And last, but not least, the Nexus 7's hardware and pricing would make it very appealing to high income consumers looking for a secondary tablet device (this market would be considerably large within the US). Once a buyer is on a platform, he/she may later consider upgrading to a higher end model. Considering that most users prefer to retain their smartphone/tablet platforms, it is likely that their next purchase would be a higher end Android tablet. In my previous article about tablet market segmentation, I mentioned that I expected Android tablets to overtake the iPad's market share by Q4 2012, thanks to the release of the Nexus 7. Does this mean that I expect this market share gain to come exclusively from the Nexus 7? Absolutely not. Google & Asus expect to ship around 3 million units in the second half of the year. Even if demand explodes, it is unlikely for shipments to exceed this number by much, as Asus and their contract manufacturers may not have the required scale. 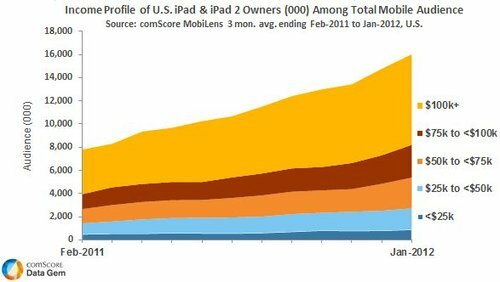 It is obvious that this doesn't even come close to the expected sales of the iPad during that time frame. So how exactly will the Nexus 7 help in overtaking the iPad? To answer this question, we need to look no further than the smartphone market. Google and Android OEMs have always followed a "Portfolio Approach" in their competition with Apple. Even though Android OEMs held a distribution advantage in the smartphone market, which may not be applicable in this case, the ability of multiple OEMs to target consumers across price points has always been an advantage. Now, this "Portfolio Approach" will work only if Android OEMs decide to mimic Google's product & pricing strategy with the Nexus 7. This already seems to be happening, with Acer announcing their own Nexus 7 competitor, the Iconia Tab A110, with the same specs and pricing. In addition to this, Asus expects to sell their own variant of the Nexus 7 at $159-$179, Amazon will soon drop the price of the original Kindle Fire to $149 and launch the upgraded Kindle Fire 2 at $199. By the end of the year, this price war should intensify, leading most Android OEMs to offer their own quad core, 7-inch Android tablet at or below $200. This upcoming competitive intensity is exactly why Apple has entertained the idea of a iPad Mini. Granted, the most Apple can do is go down to a price point of $300, but that may be enough to at least retain the market share lead going into 2013. If the iPad Mini is not announced this year, Android tablets should overtake the iPad's market share by Q4 2012. However, if the iPad Mini is launched at $300, the platform leadership change should be delayed by at least two quarters. Meanwhile, Microsoft seems to be completely oblivious to the pricing trends in the industry. Most estimates expect the Microsoft Surface to be priced at above $500 for the ARM version and nearly $1000 for the x86 version. In addition to this, Microsoft seems to be charging OEMs more than $80 for Windows RT licenses. This means that Windows RT tablets will most likely by priced at $400 or above. At these price points and given the lack of content base, it will be extremely difficult for Microsoft to compete. Microsoft may even face challenges with enterprise adoption of x86 tablets as the pricing will be similar to ultrabooks. In a recent survey by TechRepublic, numerous CIOs stated that ultrabooks are priced too high for them to consider. Conclusion - The announcement of the Nexus 7 tablet should spur most Android OEMs to launch products at similar price points. This price war will create greater competitive intensity with the iPad, and could result in Android tablets taking overtaking the iPad's market share by the end of the year. list and decided to spent the rest of the weekend browsing. Well done! You don't think then that MS is actively pursuing people willing to shell out the extra cash to get a "work" tablet, instead of an entertainment tablet? MS can actively pursue that all it wants, but even they know that the x86 device will not be a mass market device. That's why they're launching it 3 months after the WinRT device. That's not to say "no one" will buy it, but the market potential is very limited. The biggest potential market for that product is enterprise customers and if 11 out of 12 CIOs think that price point is too high, then I seriously doubt if you will see more interest from the consumer segment. I think you missed the fact that iPad and Android Tablets are not in the same category. iPad is a tablet computer. With 250000 of Apps especially designed for, using the large 10' screen. Nexus7 and other 7' Android tablets are just large smartphones. Android Apps are today at 99% designed for small screens. This is due to the fact that Android 2.X, a smartphone-only version, represents today more than 80% of Android devices. So developers stay focus on smartphone apps. incredibly myopic view of the market. First, this whole concept of the need for tablet optimized apps is complete hogwash. "Fragments" is a code block that Google uses to get application layouts to automatically scale to any desired screen size. Anyone that's used a Google+ or Google Currents app on both a smartphone & a tablet understands this. This is why Google wants Android developers to focus on building apps for both platforms and not just smartphones or tablets, like Apple does. And this isn't particularly difficult either, definitely a whole lot easier than designing a stand-alone "tablet optimized app". But in order to make more and more developers do that, they need a growing install base to sell them on, and that's exactly what they're going to accomplish through this pricing strategy.